This product requires the base game Warlock 2: The Exiled. This pack brings you three new lords that you can select as starting perks for your Great Mage. Each lord comes with unique stats and abilities. "Nicolas Frost, the Head Mage of the Temple of Cold and the former Great Mage is offering his services." - In order to get this lord near your capital at the start of the game select the "Cold Wanderer" faction perk for your Great Mage. "Leya Inverse-Gabriev, the Magical Genius. She is a very highly-skilled magician, and her magical services are not as expensive as you might think." - In order to get this lord near your capital at the start of the game select the "Magical Genius" faction perk for your Great Mage. "Halfall. You might not have heard his name before, but that is your loss. This lord is an ultimate "Jack of All Trades", and he offers his talents to anyone who can afford it." - In order to get this lord near your capital at the start of the game select the "He Has It All" faction perk for your Great Mage. 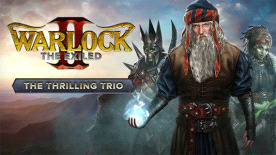 Warlock 2 is required to play this DLC.